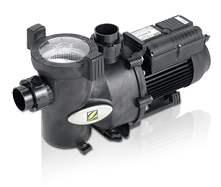 The Zodiac FloPro pool pump is a quiet, energy efficient, high performance pool pump specifically designed for Australian conditions. Backed by a 3 year warranty (2 years on the mechanical seal) you can be assured of many years of hassle free enjoyment. Equipped with an ergonomic cam lock lid with easy alignment indicators to ensure maintenance and everyday use is a breeze. Features 50mm barrel unions for increased water flow resulting in better performance. The motor has an oversized capacitator to ensure consistent, reliable performance. The design of the FloPro pool pump controls the flow dynamics within the pump resulting in less noise and quiet operation. The body is made from quality Noryl Plastic – this type of plastic is being used within the car industry to replace some metal parts, making it durable and tough.